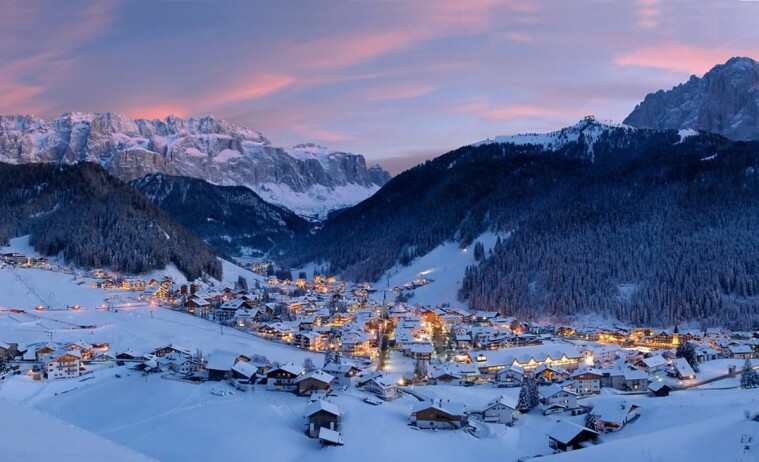 If a vast area of terrain to explore, family-friendly on- and off-mountain amenities, and a culturally rich village is high on your ski vacation laundry list, then a Val Gardena is an easy choice. Val Gardena is among Europe’s best places to enjoy a traditional après-ski thanks to its wide open, sunny vistas and many alpine restaurants. The town of Val Gardena is about 13 miles long and runs more or less from west to east from the narrow entrance to the valley at Ponte Gardena up to Passo Gardena and Passo Sella, at the north-east of the “Südtirol” Dolomites. Val Gardena is easily accessed, since it’s well connected via train with the rest of Italy and the larger Northern Europe region. The closest airport for ease of access to Val Gardena is Bolzano at 30 miles away. A 6 seat Cessna Citation CJ2 jet from London to Bolzano is approximately 1 hour 45 minutes. A larger 8 seat Cessna Citation XLS will complete the journey in 1 hour 35 minutes. The Drive time will take approximately 1 hour. A helicopter will get you there in 35 minutes. Arranging a private jet charter or helicopter transfer with Freedom Air to arrive in style to Val Gardena is simple. The Freedom Air team can be reached on +44 (0) 1275 548001 to book your next trip.